Latina of Influence | Angélica S. Gutiérrez, Ph.D. Educator, Mentor, and Community Advocate Angélica S. Gutiérrez, Ph.D. one of Hispanic Lifestyle’s 2013 Latinas of Influence. About our Latina of Influence – Angélica S. Gutiérrez, Ph.D.
Angélica S. Gutiérrez, Ph.D. was born and raised in the Los Angeles community of Lincoln Heights. She received her B.A. in Political Science and Sociology with honors from the University of California, Los Angeles and her M.P.P. in Public Policy from the Gerald R. Ford School of Public Policy at the University of Michigan, Ann Arbor, where she was elected as the school’s Executive Committee student representative and served as the student voice on all university matters. Dr. Gutiérrez recently earned her Ph.D. at the UCLA Anderson School of Management. Her research interests include diversity and inclusion in universities and in the workplace, and the effects of stereotypes on negotiations. She has presented her work at the Academy of Management and the Society for Personal and Social Psychology — the two leading conferences in the fields of Management and Psychology, respectively. Her research has been published in the Journal of Experimental and Social Psychology, a top journal in the field of Social Psychology. At UCLA Anderson, Dr. Gutiérrez taught the summer course in Organizational Behavior for entering international MBA students. She also assisted in teaching various courses including Leadership Foundations, Negotiations, and Organizational Behavior for the full-time, fully-employed, and Executive MBA programs at Anderson, including seminars in Shanghai, China. After completing her Ph.D., Dr. Gutiérrez was awarded the University of Michigan’s National Center for Institutional Diversity postdoctoral fellowship, and is serving as a postdoctoral fellow and visiting scholar at the Stephen M. Ross School of Business. As a postdoc, Dr. Gutiérrez’s research focuses on diversity and inclusion in the work place, including the representation of underrepresented groups on executive boards. With her research she hopes to increase the representation of ethnic minorities in business school and diversify corporate America. After completing her postdoctoral fellowship Dr. Gutiérrez will continue her research and teaching pursuits as a tenure-tracked professor at the Loyola Marymount University College of Business beginning in August 2013. 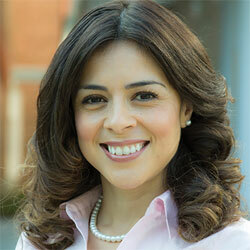 She will be one of a select few Latina business school professors teaching at a U.S. business school. Prior to UCLA Anderson, Dr. Gutiérrez worked in the fields of education, transportation, housing and economic development, in the private, public, and non-profit sectors. She served as the transportation policy analyst for Los Angeles Mayor Antonio Villaraigosa during his tenure as Chair of the Metropolitan Transit Authority. Additionally, she was the policy analyst for the Executive Management team for the Los Angeles County Community Development Corporation. Despite her rigorous work load, Dr. Gutiérrez has devoted her spare time to several organizations in hopes of giving back to her community. Dr. Gutiérrez has served as a mentor through the Hispanic Scholarship Fund, the TELACU Education Fund and UCLA Riordan Programs’ Saturday Business Academy. Moreover, she has conducted presentations on negotiations, networking, business etiquette, time management, and organizational diversity challenges for professionals in the non-profit and public sectors. She also enjoys volunteering for various philanthropic organizations, including Reading to Kids, Padres Contra el Cancer (Parents Against Cancer), and the California Latino Caucus Institute’s Madrinas Padrinas Leadership Program. Additionally, Dr. Gutiérrez devotes her time to inspiring young students to strive for their dreams through panel discussions and keynote addresses, including Overcoming the odds: the power of purpose, passion & perseverance, which she delivered as keynote for the annual Latino Leadership Conference at Purdue University, and presentations for the USC Latino Alumni Association, USC Upward Bound, Los Angeles Mission College and Whittier College. As a result of her academic achievement, Dr. Gutiérrez has been a four-time awardee of the TELACU Education Foundation David C. Lizarraga Fellowship, a Gerald R. Ford Graduate Fellowship awardee, Ronald E. McNair research scholar and a Hispanic Scholarship Fund awardee. She also received the “Young Promising Rese arch Scholar” award by KPMG’s Ph.D. Project, an organization committed to increasing the representation of racial minorities in academia. Last year in recognition of her community leadership and contributions, Dr. Gutiérrez was selected as one of the first “Next Generation Latinas” by Latina Magazine, an award that honors Latinas who have made a significant impact in their respective communities as role models, mentors and leaders, and exhibit a strong commitment to the empowerment of other Latinas. Additionally, Dr. Gutiérrez was recently recognized as one of the first “Latinas of Influence” by Hispanic Lifestyle for her accomplishments and community service.